These pictures were uploaded to flickr by Luana Rubin, so I don’t know much about the quilt itself, but this quilt is fantastic. 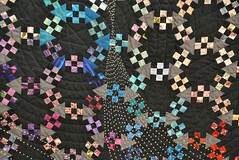 You’re seeing a small portion of the quilt, the entire quilt is found http://www.flickr.com/photos/luanarubin/6821791221/. But THIS photograph shows the hexagons, the Nine Patches, the Equilateral Triangles, and the heavy Sashiko Quilting in sections. I may have said 4 patches, but these are definitely 9 patches. Up close the quilt gives you lines, angles, movement and repetition.